So I have been mucking about with my wild yeast sourdough starter a lot over the last few weeks. I made pain poilane, and a traditional american style sourdough, and was thinking..."what else can i do with this starter?" Hopefully this will spark some interesting sourdough ideas. I'd love to here more. I'm planning on writing about the chocolate ones tonight. I made Sourdough Crossants a while back and posted the recipe I used here. A couple people said it was the best Crossants that they have ever had. Making them was a new experience for me and enjoyable. I really liked how they turned out. Those are lovely croissants and I enjoyed your shaping of them...I would have enjoyed a crumb shot as well..maybe next time! I used the same recipe from DL Local Breads the first time I made croissants...I also made almond filled bear claws using the same recipe...I posted photos but when we changed to the new server they were lost and I only have the one photo on file now of a bear claw....my old camera!! Though I enjoyed the recipe I have made a couple of other recipes and my favorite is the one posted on my last croissant post in my blog. Trailrunner: I'd love to post the recipe, but I'm not sure what laws apply to sharing recipes over the net that came out of published cookbooks. If anyone knows, can you let me know? Sylvia: Thanks, I have a crumb shot of the chocolate ones I made, which I'm planning to post soon. 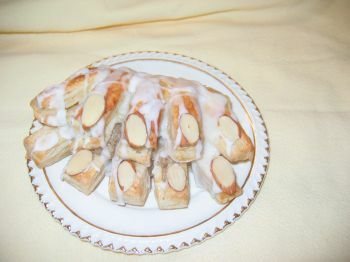 I like the almond filled bear claw idea. That's exactly the type of creative use of sourdough I like to see. Adelphos, look here for a discussion on posting recipes. The concensus seems to be that you can post an individual recipe from another source, as long as you credit the source. Yumm, the chocolate crumb shot looks devine! The inside shot was taken fresh from the oven. Due to the chocolate, you can't really see how well the structure turned out. they were actually soft, flaky, and airy. Just how a croissant should be. You will love it...One of the very best out there...top rated!